This chapter considers some aspects of an ethnomethodologically oriented ethnography that has been carried out in a medical Emergency Response Centre (ERC) before, during, and after an IS-related organizational change. After a description of the everyday work in the ERC and its larger social arena, the authors discuss the main changes and the users group’s resistance that mediated the new technologies’ transformative potential: the rejection of abandoning ‘old’ cooperative work practices, and the emergence of an innovative one, with its own condition of appropriateness, applicability, and accountability. Finally, starting from the evidence that solutions to problems emerging in a field must be coherent with the endogenous organization of activities of that field, with the configuration of inter-actions that actually sets up that context, the authors discuss the necessity of co-design(-in-use), and the possibilities provided by ethnomethodological ethnography as a tool for action research in IT design and techno-organizational change management. The chapter considers some aspects of an ethnomethodologically oriented ethnography (e.g. Crabtree, Nichols, O'Brien, Rouncefield, & Twidale, 2000; Fele, 2008; Sharrock & Randall, 2004) that have been carried out in a medical emergency dispatch “centre of coordination” (Suchman, 1993, 1997) before, during, and after an IS-related organizational change. Emergency Response Centres constitute stressful and time-pressing, hi-tech, and information-rich environments, in which communication, on the one hand, and information management (gathering, use, transmission, archiving, etc. ), on the other hand, are the primary work activities—and are largely technologically-assisted activities. It is a complex and changing, situated configuration of people, artifacts, knowledge, information, activities, and practices that constitutes the organization itself. ERCs, therefore, can be considered as socio-technical systems (e.g. Avgerou, Ciborra, & Land, 2004; Button & Sharrock, 1998; Suchman, 2002; Suchman, Trigg, & Blomberg, 2002). The process of design, introduction, implementation, and use of new Information and Communication Technologies (ICTs), indeed, is not simply a technological one, but also a social one, and always entails related changes in the organization of activities and work practices, changes that need to be addressed, managed and designed. It is not that, accordingly to the “technological imperative” (Markus & Robey, 1988), IT “impact” in a univocal way on individuals' and organizations' acting: as we shall see, (groups of) people appropriate, make sense, and use artifacts in various emergent and dynamic ways. It is neither that, accordingly to the “organizational imperative” instead, IT designers and/or organizational managers have “almost unlimited choice over technological options and almost unlimited control over the consequences” (Markus & Robey, 1988, p. 587), so that they could exploit IT, in a predictable way, as a tool for solving problems and satisfying needs of the organization. As I shall try to show, innovation is never a merely institutional process, it is never just about standardized procedures and formal routines; on the contrary, it is also an interactional process, it is also about situated practices and improvisation. 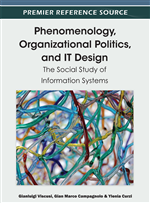 Looking at IS-related organizational change processes from a socio-technical perspective, therefore, means considering not only technology itself, but also and especially technology-in-use (Suchman, 2002); not only the formal properties of facilities and artifacts, but also their actual usability in context (Adler & Winograd, 1992). The latter consists of the new technologies' appropriateness and usefulness with respect to the actual organization of working activities in the time and space specific context in which specific (groups of) people shall use them alongside pre-existent tools and ICTs. Usability consists of technologies' coherence with everyday work practices and the logic(s) underlying such practices. Furthermore, a socio-technical approach to techno-organizational change entails taking into consideration the whole set of individual and collective actors—designers, (future) users, managers, etc.—as well as the different ways in which they frame, appropriate, and make sense of the everyday, technologically-mediated work practices, on the one hand, and, on the other, of the change itself. It is thus necessary, first of all, to analyze the everyday work practices in and through which participants produce, recognize, and co-ordinate their technologically oriented activities (Heath & Luff, 2000), the way in which they orient themselves towards each other's (verbal and non-verbal) conduct, and “constitute the occasioned sense and significance of features of the setting such as objects, artifacts and the like” (Heath, Hindmarsh, & Luff, 2010, p. 87). As I shall contend, an ethnomethodologically oriented ethnography, with its focus on the minute details of (naturally occurring) action and interaction, on order and routine as practical accomplishment, on “actions-as-constitutive-of-their-settings and settings-as-constitutive-of-their-actions” (Heritage, 1984, p. 308), could be extremely helpful in such a task.